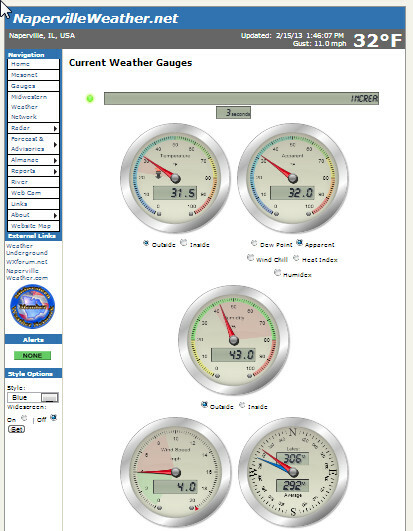 As part of routine maintenance of my NapervilleWeather.net website, I found reference to Mark Crossley’s Sandaysoft SteelSeries Gauges. Mark runs the SandaySoft.com website dedicated to the support of the Cumulus Weather Station Software. He’s developed a fantastic set of scripts that display, in realtime, data from your website in graphical gauge-style form. 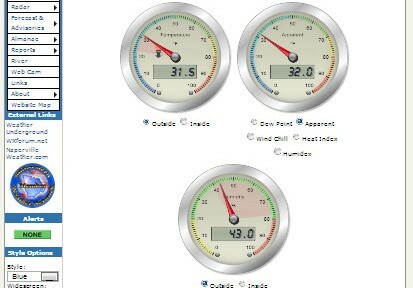 While originally developed for Cumulus Weather Station Software customers, it has been very nice extended to Virtual Weather Station and Weather Display station software users as well. I am a user of the Saratoga Weather Scripts, supported by Ken True. Within the last couple of weeks, Ken issued an update to his scripts to make it really easy to add Sandaysoft SteelSeries Gauges to my web site.